NorthStar fairly early on saw the utility of going with dynamic RAM boards. 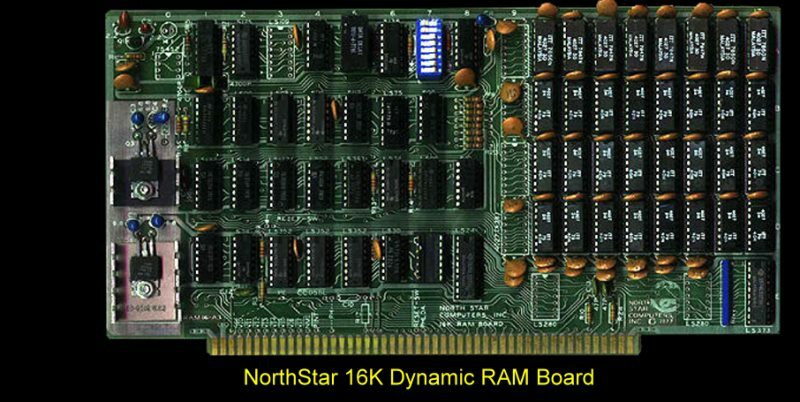 The North Star 16K byte RAM board (RAM-16-A) was compatible with most S-100 computers. The board will operated at full speed with both 8080 and Z80 microcomputers, even with 4 MHz operation. The industry standard 16-pin 4027 RAM chip (200 nanoseconds access) were used. A parity option was available for use with the RAM-16-A. The RAM-16-A could be addressed to any 16K region beginning at any 8K boundary. The RAM-16-A has a bank switching feature which allowed more than 64K bytes of RAM to be used in the computer, and also facilitated special software applications such as time­sharing . The manual for this board can be seen here.